Login screen, Crew, Music and more! Likes our products? You can support us via Paypal ! Not supported since WoT 1.2. AniWOT Mod Pack: Open the exe file. Browse to your game installation folder. Choose any mods you need. Install. Done. Piece of cake. Turn off any UAC settings in Windows Firewall before installing if needed. In case the exe launching was stopped by Windows Smart Screen, depends on Windows version, make your way to choose "Run anyway" to open the exe file. TaLLIePO Miku Garage: Extract the downloaded file. Copy 2 extracted files to [your game folder]\mods\1.0.x (where x is the latest version of WoT). For detected current issues and bugs, please see the Known Bugs section below. Applied for all editions installed. Tested in our PCs (2 beta testers). These bugs are being fixed by us and based on priorities. We will release a hotfix when any or all of them are fixed. 1. Music for after battle (battle result) is currently could not longer than a few seconds. 2. Crew voice for "gun reloaded" is not working. - ASMC is a "Mod Collection", therefore it may contains pictures, musics, sounds, characters, objects, effects that collected from many other sources. We do not own any of them. They are belongs to their respective owners. - ASMC Music and Sound Mods contains encrypted and protected audio contents that might be copyrighted. Therefore, our products are for personal and internal uses only. Streaming, extracting, publishing, decrypting those contents that not for personal uses may violate our Agreement, thus will not be our responsibility. - ASMC only focus on Interface and Music Mods. Most of other mods that included in our AIO Mod Pack such as crosshair, minimap, XVM... are from other sources and not made by us. - ASMC's products are free-to-share, means that Repost is allowed. BUT PLEASE DON'T CLAIM IT'S ALL YOURS. We did our hard work here. BY DOWNLOADING AND USING MODS, YOU AGREE THAT YOU LEGALLY OWN IT'S CONTENT, AND THEREBY ACCEPT ALL LEGAL RESPONSIBILITIES. 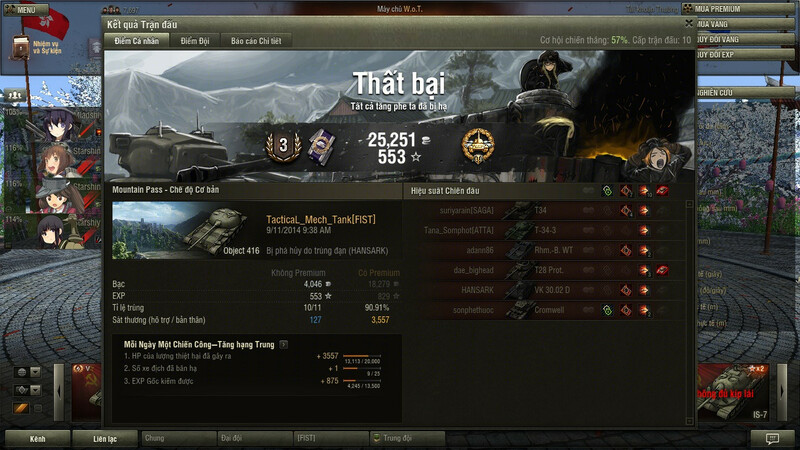 After days full of fierce battles, you sit and rest in your tank's garage and suddenly realized that the game's factor such as soundtracks, images, ... becomes too familiar with you and have no changes since your first time played WoT. Then why wouldn't you try out our mods? We will bring to you a new fresh air with cute anime girls and tankers' spirits, leading you to your victory! Established since WoT 0.8.10 (January 2014), along with The Rising Sun country's tank, the "ANIME-Style" Mod Collection (aslo known as "ASMC" ) has go through a long way in order to improve, to satisfy our tankers all around the world. 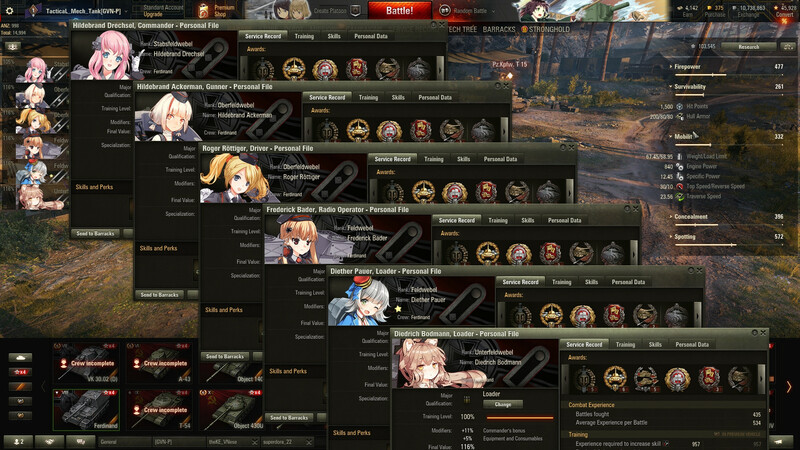 Despite lots of difficulties, today we still developing this collection, for every tankers to have a better experience while playing WoT with a combination of anime world. Enjoy, and thank you for trying our mod! Thrust deep into our hearts." 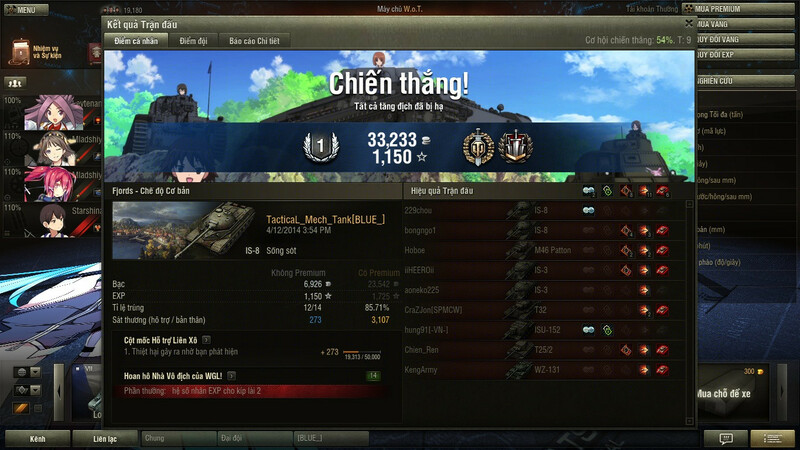 We hope everyone will like our contribution for the better WoT experience! - English is not our native language, so if you are a Grammar Nazi then please be mercy. - Read instruction about how to install mod carefully. - If you have any problem, feel free to contact us via comment or PM. We will answer your question as soon as possible. Came from other server without having an ASIA server account? Then you can contact us via Facebook. In this section, you can enjoy musics and pictures inside our mod before downloading and installing them. For musics, to avoid any copyright issue, we only provide to you the similar content from Youtube that posted by other people. Pictures haven't found a way yet. Grab popcorn and see what our mod can do. Notice that some outdated mod that doesn't work anymore may appear in some old videos. After 2 years away from the game, I’m back with a huge overhaul for Apocalypse Edition, namely Steel Maiden, which I had been elaborately brooding and creating for a long time since then. The mod pack was originally had a short prologue story, but I decided to keep it just for me since it’s long to post here (just a short story about the panzer girls appear on the loading screen in action). - Very detailed hangar UI mods. Whatever you do in the garage, from checking your progress in the campaign, rearranging your equipment in the depot, or just simply want to extend your barracks, … you will find out interesting features in them. - The special anime crew mod that possess unique crew for each country, all dress in uniform with easy to recognize thematic features (some are also cute for research material, too). 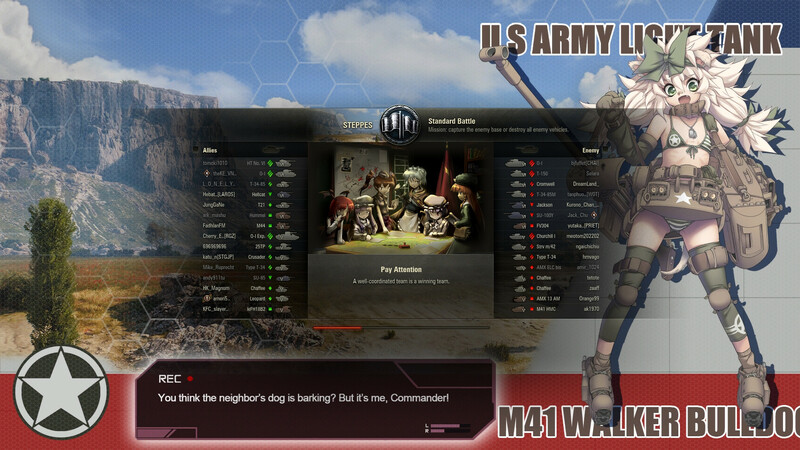 - Battle loading screens with the panzer girls that are actual the personifications of ingame vehicles. - Anime tips that makes you laugh or even do a tactical facepalm, and they are matched with the game’s original tips. - Splendid battle result screens shows up every time you walk out from the battlefield, laugh proudly for the victory or cry regrettably when you lost. Our mod cannot shine without it. If you are having a familiar feeling like above, then it’s time to flush them out of your head. Our music mod features selective and impressive tracks taken from notorious anime that makes you bristle because of the composer’s excellence, such as Sword Art Online, Mirai Nikkin, Naruto, or even the legendary Gundam series. - Login music with dark, strong atmosphere that fit the login screens so well as the welcome every time you start the game. 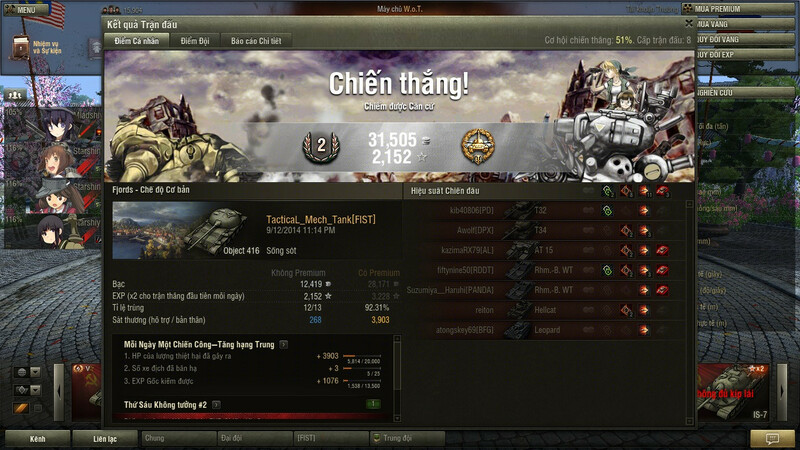 - Need to do some research in the garage with your tank, crew, or game mechanic? Thrilling, epic and strong yet emotional anime vocal tracks from military-related and bloody thematic anime will make you love this job. - Selective, unique and impressive battle intro music for every map. You will travel the world from the fiercest battlefield like Overlord to the most peaceful and memorial one such as Redshire. - And when you are in a tight situation? Let the epic, thrilling orchestral-rock thematic battle music inspire you to your most desperate measure. In order to enhance your experience while enjoying the new appearance of the game, we also introduce the use of sound and other mods in our mod pack that will definitely finalize its perfection. - Female anime crew voice, with 2 variants: one for the moe-lovers with cute voices from anime GJ-bu, and the other serious voice from Shana (anime Shakugan no Shana) for the not-so-dere tankers. - The popular and easy to install but outstanding Thundering gun sound mod. Fortunately, those are not the last of our mods! Dive in to find out more on your own! - New login screens, only historical vehicles are chosen to fit the game theme. 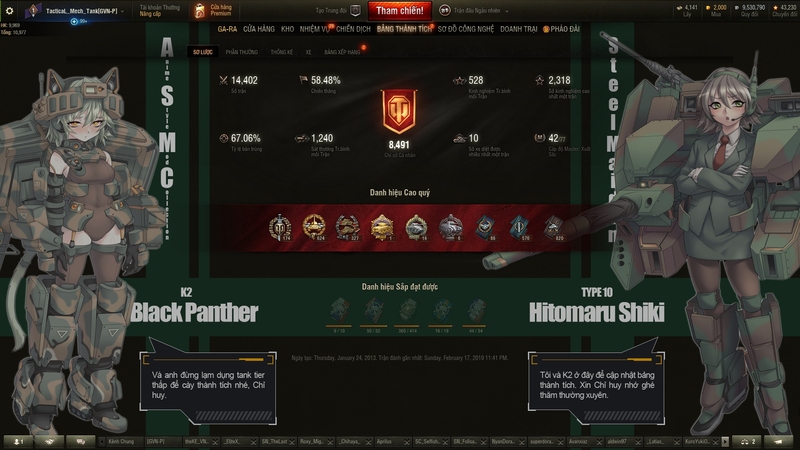 - Brand new hangar UI mods, update ingame UI mods for the new version of WoT. 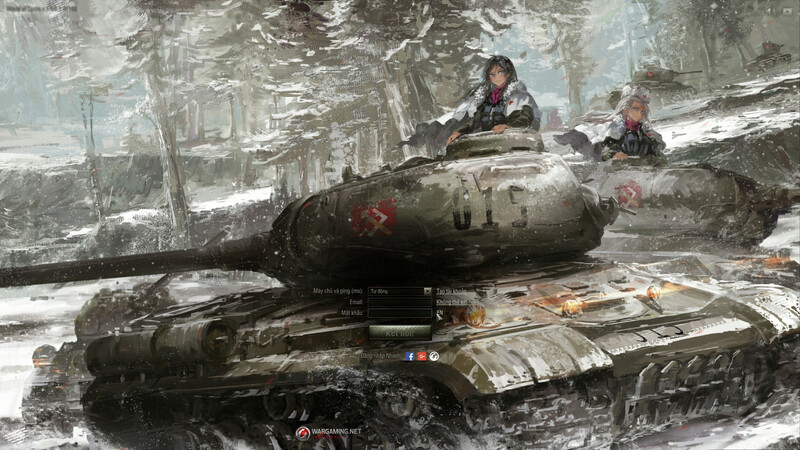 - Total rework for battle loading screens with new panzer girls (T-62A, M48 Patton, … . - Brand new anime tips matched with the game’s original ones. 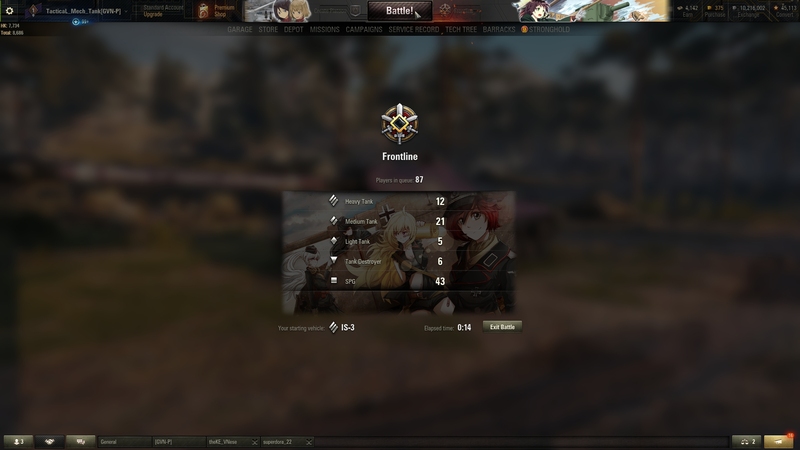 - New battle result screen for frontline and other game modes. - And more to find out! - Login music: 5 tracks, 4 new tracks. - Hangar music: 20 tracks, 15 new tracks. - Intro music: 45 tracks, so many new tracks that I could surely point out (some maps have special alternate intro version). - Result music: Currently facing a problem, they can only last for 5 seconds, I’m working to solve it, still, there are more than 5 tracks in total. - Updated for the current game version. After the destruction of all previous sound and music mods in WoT 9.14 (caused by WG changing their sound engine platform from FMOD to WWIse), we struggled to rebuild. Months later, a prototype was born. Due to the situation, we named it "Apocalypse Edition". It was first released in March 2016. As soon as it aired, Apocalypse Edition was quickly become our most popular mod pack. The number of download time was more than 1000 after 1 month of release date. The contents was based on our previous mods, which was highly appraised, where the theme is familiar from the game itself, so even a non-anime player will able to play with this at ease. Since then, Apocalypse Edition were being updated regularly after each release, and still attract players around the world, especially North America and South Asia region. Spring Edtion was first announced in January 2015, and changed our Music Mod style since then. It was very popular at that time, especially in Vietnam, where it was built. It is now known as the first Seasonal Mod Pack that hit the world. It was destroyed in WoT 9.14 (March 2016), and the Rebirth version was released 1 year later (January 2017), also have the same theme. Since then, Spring Edition were updated commonly along with each WoT release. It's the first seasonal mod pack that have an offline music player as login video, and the second Seasonal Mod Pack. Currently there are more than 40 songs available in this player. They comes from login and hangar music of both Instrumental and Vocal version. The theme was based on Spring Edition, but with modern instruments and modern styles. Summer Edition made it debut in many countries and most successful in South East Asia, where the player finds familiar with its style and soon it became their favorite. The last "Rebirth" series Seasonal Mod Pack. Originally it was not planned to be release in 2017 waiting for TacticaL's return, but Nyan changed his mind in October. Not planned before and lack of time, the project completed with only 4 days of development. The below video login mod were actually made in just 3 hours. Still, it made a great debut as a worthy downloading contents for WoT Mod. The content was simple, and effectively fits the game atmosphere, which is why this is TacticaL's favorite Seasonal Mod Pack. About my opinion? I liked all of my works, teehee. If you asked "which edition was our best" then Winter Edition is our answer. Why? Because it was getting downloaded regularly and increasing by time. The theme was good, easy to listen, fits the cold atmosphere, and outstanding combat music taken from Falcom Sound Team, made it really hard to find what was not good enough in this mod. No doubt that many people loves it. Planned to be our last work, Farewell Edition was first released in February 2016, a month before the Apocalypse hits in WoT 9.14. It was unexpected to really fits it "farewell" theme at that time (say goodbye to all of our previous works). When things got on track again, the Rebirth version was released one year later (January 2017), and become many player's favorite music mod as I received many requests from players around the world, asked to share the playlist of this one. Of course we repiled. They were lived happily ever since. Now, Farewell Edition is not really the last work of us to say "farewell". But its still considered as a last part of the Seasonal Mod Pack, where all the four seasons ended; says farewell to the passed year, and welcome the upcoming new year with new inspirations. "ANIME-STYLE MOD COLLECTION" IS A FANMADE GOOD WITH NON PROFIT PURPOSE. IT CONTAINS MUSICS/IMAGES/PARTICLES/EFFECTS THAT GATHERED FROM MANY SOURCES, THAT STRICTLY FOLLOW THE "U.S. FAIR USE FACTORS". WE DO NOT OWN ANYTHING OF THEM. THEY ARE © & ® TO THEIR RESPECTIVE OWNERS. Input: MP3 256/320Kbps / WAV 900-1600Kbps. Output: Vorbis 64 samples/s, BNK or PCK output extension. Plus XML editing method. Input: MKV/AVI 1920x1080 10000-16000Kbps. Output: Use framerate from input. USM output extension. Input: PNG/JPEG/BMP 16/24 bits. Output: DDS or SWF output extension. Edited by NyanDora_Mech_Tank, 21 April 2019 - 08:45 PM. Thanks~ will download for later. From January 2016, this mod collection has divided into many parts to extend space. Simply click to the phrase "Visit post #X for details and download" in the main page, it will bring you to your needed mod automatically. Developed since WoT 9.13 and appeared for the first time in Farewell Edition (February 2016 - WoT 9.13), this mod has become one of the main Interface Mods. It changes the background image when you're waiting for the battle to be loaded. The predecessor of this mod is the characters standing side by side with the player list, as you can see in older seasonal mod pack's Interface Mod. Designed for some "quite serious" mod pack (Normal Mod Pack/ Apocalypse Edition) and published in March 2016, this kind of Loading screen Mod can be used in any cases but still contain the "Anime-related" theme. Instruction: Use "Open in Drive" to download. Extract the downloaded file, then copy res_mods in the extracted folder to your game folder. Currently available in Winter Edition Rebirth mod pack. Will redirect to here later. Currently available in Farewell Edition Rebirth mod pack. Will redirect to here later. Developed since WoT 9.13 and appeared for the first time in Farewell Edition (February 2016 - WoT 9.13), this mod has become one of the main Interface Mods. It changes the loading icon of the game from the WoT Logo to becomes something more cute. Designed for some "quite serious" mod pack (Normal Mod Pack/ Apocalypse Edition) and published in March 2016, this kind of Loading Icon Mod can be used in any cases but still contain the "Anime-related" theme. Mostly assembled from the Internet, especially from the very famous anime "Girls und Panzer" (GuP). Notice that this mod is created by us and have no relations with the general GuP mod which was published before. Long time no update. Use with your own risk. Another time wandering on the internet, now the mod is completed. The characters are way cooler and so do the tanks. This current version have some changes: New Swedish and Czech crew and Female crew. USA crew will have all female characters; USSR will have uniform girls and Chinese crew now features Touhou characters. Note that the USA crew will have lots of duplicated members, so you should pick them up before training the crew. Attention: You have to backup folder res/text before installing in case of rolling back for WoT update. Crew voice Mod (9.16 Ready but limited. Use the fixed one in Apocalypse Edition Mod Pack instead). From WoT 9.15.1.1, this section contains some bug. They are likely to be fixed in our mod packs, installation of other voice and sound mod may cause problems. Having cute faces and names already, now we have to fix their voice. There are 2 languages for you to choose. A prototype Crew Voice Mod made for the new sound system in WoT 9.14, appeared in Apocalypse Edition (March 2016). This voice mod contains more than 200 voice files from 5 different anime characters (including Nanoha, GJ bu and more). Instruction: Extract the downloaded file, choose one version, then copy all the contents in it to res_mods/0.9.17.0.3. No need to backup anything. Attention: Be cautious if you're install another mod that also changes the engine_config.xml and sound_notifications.xml file. It may disable the sixth sense, reload and enemy spot voice. This mod will only working normally with our mod pack. Another prototype Crew Voice Mod made for the new sound system, appeared in Apocalypse Edition 9.15 (June 2016). This voice mod contains more than 150 voice files from 4 different anime characters. This version is currently our default voice mod. Instruction: Extract the downloaded file, then copy all the contents in the extracted folder to res_mods/0.9.17.0.3. No need to backup anything. Here are some garages and skins that TacticaL_Mech_Tank was finding on the internet herself, they are very beautiful and cute. These are not my garage mod, they are from a Russian modder called "Ani WOT"
It's also contain Skin Mod too. And it's using automatic installer, which is very useful. These are not my skins, I usually remake them from an old one which didn't work any more. a) Tanks and anime characters theme: Take cover! Notice: You can use the Published Video section in the #1 postto watch more preview video. Here's a preview vidéo for an in-game experience with the mod pack. Note that they are in pretty old version, many new and better ones are released. Preview for other mods (login, garage, ...) just skip the boring tutorial to hear result music. "ANIME-STYLE MOD COLLECTION" IS A FANMADE GOOD WITH NO PROFIT/DONATE BEEN MADE. BY DOWNLOADING AND USING MODS, YOU AGREE THAT YOU LEGALLY OWN IT'S CONTENT, AND THEREBY ACCEPT ALL LEGAL RESPONSIBILITY. Edited by NyanDora_Mech_Tank, 30 January 2017 - 09:53 PM. Thanks for the extra effort to make it available to english-speaking user! Attention: This section does not include the music of our Special Mod Pack (Spring/Summer/Autumn/Winter Edition and more in the future) to reduce the amount of text. In brief, they are One-shot version of Music Mod, and Special Mod Packs are Seasonal series. We have 4 versions in here, you can choose based on your demand and inclination. The only differences are in the login and result music. Instruction: Extract the downloaded file, then copy 2 files in the extracted folder to res/audio. Attention: You have to backup folder res/audio before installing in case of rolling back for WoT update. There are basically 2 kinds of music in here. Anime-based music, collected by TacticaL_Mech_Tank. Divided into 6 versions: Hard music (Rock, R&B...) and Slow music, with and without vocal. Military-based music, collected by NyanDora_Mech_Tank. Since Summer 2015, this part has started to remake and named The Origin series, planned to be re-released around mid-2016. For now, it's temporarily divided into 2 versions: Moderate and Serious. All are instrumental and suitable selectively for all Crew Mod. TacticaL is an impartial person and she loves anime (still far to reached "Otaku" level yet, though maybe at Weeaboo), so basically she is sure that everyone else (maybe most of them are anime fans) will download and favorite her music mod. What can I say? Well, they are good, I can't protest it at all. TacticaL told me that she is using this. Suitable for beautiful sight seeing garage. From my heart, I'm glad that you've chosen this. Many people thinks that "Military song" is cruel and serious. Well it's ALL WRONG in here! I've selected these music from hundreds military marches in order to combine with ANIME theme and I'm sure that you'll appreciate this as "Cheerful and Energetic". Besides, contemplating your tank while listening military marches is perfect, right? Just try it and you'll see that your choice is right. Musics from real-life German and Australian traditional military march. Edited by NyanDora_Mech_Tank, 07 June 2016 - 10:37 PM. Gee, thanks for sharing this mod pack for the English community . The mod pack still be in use, and I'll always update it as WoT updates, or as you guys find out any problems. Let's spread the love of anime over the community . Nice job you've done there. Too bad we're having an extremely difficult semester at the university so may be the link will be update a bit late (although it's already updated in the original post). Thanks for the patient, it will be updated not later than this weekend (after finishing the first subject's final exam). It's been a year since the first seasonal mod pack had created, the Spring Edition. And after that are the Summer, Autumn and Winter. Now, Lunar New Year has come again. "Everything would come to an end." "But memories are still present, for now and forever." Words are not enough to express what we want to say, but... here it comes: The Farewell Edition. Yes, we confirm that this is the last seasonal mod pack. Reasons has been told before, leads to the fact that we can't working together anymore. We're deeply sorry about this. But nothing we can do for now. So, here is our new year gift to everyone, and... it would be the last one. Thank you for following us till this day. ひとりのこの心は　何処へゆけばいい？ Where does this lonely heart have to head to? Every memories are still right here. Ｓｔａｙ　もう少しだけは　このまま Please stay like this, just a little more. 滲んだこの心を　そっと包んでる Softly embraces my blurring heart. Before i knew it, i have passes them. Ｃｌｏｓｅ　忘れてしまうの　このまま Close, have you forgot them all, just like this? I further and further distance with myself from the past and memories from that days. (Lyrics from "Tsuzuru Omoi" (After All) - White Album 2 Original Soundtrack. Translated by Yinism Translation. The announced "last seasonal mod pack". All of the greatness are planned to apply here. Garage songs in Instrumental version are mostly piano. All the other BGM are styled combination between Eastern and Western traditional styles, mixed Spring and Winter. "I'm bored at pointless advertising. Just try it and we will see how great is it." Anime-based features are also included, now with many improvements. Music mod by NyanDora_Mech_Tank and Interface mods by TacticaL_Mech_Tank. The announced "last seasonal mod pack". All of the greatness are planned to apply here. Garage songs in Vocal version are lively and then "bitter sweet" J-POP like Winter. All the other BGM are styled combination between Eastern and Western traditional styles, mixed Spring and Winter. OST Sources Major: White Album series. Fairy Tail series. Minor: Panzer Dragoon series. Deus Ex series. Evangelion OST. Major: White Album series. Fairy Tail series. ​Minor: Panzer Dragoon series. Deus Ex series. Evangelion OST. Instruction: Extract the downloaded file, then copy 2 folders (res and res_mods) in the extracted folder to your game folder. - J1mB0's XVM Config with J1mB0's Crosshair. - Zoom-in 5 levels (2 4 8 16 30) and Zoom-out. - Crew image and crew voice enhanced version. Login screen Image: Link download coming soon. Battle Loading Generation II: Link download coming soon. Sixth sense Image: Link download coming soon. Loading Icon: Link download coming soon. Fairy Tail Original Soundtrack Vol.1, 2, 3, 4; Fairy Tail Movie Houou no Miko Original Soundtrack. White Album 1, 2 ~introductory~, ~answer~, ~closing~ Original Soundtrack. Music Album: White Album 2 Vocal Collection, White Album 2 OST ~setsuna~. Sayonara Arigatou (さようなら ありがとう) by Natsukawa Rimi (2005) (only appear in the Farewell Edition BETA - Extreme (Vocal Garage) if you are using WarGaming's Premium Account). All the above tracks © & ® to their respective owners. Spring/Summer/Autumn/Winter/Farewell Edition's original work by NyanDora_Mech_Tank and TacticaL_Mech_Tank. Time passed so fast and 2015 is nearly ended. Here, at the edge of the year, we're standing together and sharing our memories, some are good things but some are regret as well. But after this day, it will be the start of something new. Let's keep the smile and join us to celebrate Christmas and New Year. Winter is a very special season that connecting two years together. She gives you cold breeze at first, but slowly warm up day by day. I think that would be a good hint for what's inside our Winter Edition: Full of joy. Plenty of sadness. And it's for the last time of the year, so there's no holding back. With the help from my fellow TacticaL_Mech_Tank, our Winter Edition had been completed. We did our best to make it as good as it could. We hope that everyone else will love it, too! (Lyrics from "Hoshi no Arika" (Where the Stars are) - The Legend of Heroes (Sora No Kiseki FC) Original Soundtrack. Translated by Asamidori and Animeyay. I still remember the day when Spring Edition were released. Will we be able to meet her again? Info Like Autumn, Winter also have combined styles of musics and designed to be one of the greatest Music Mod ever. Vocal login music. Two phases garage music: Sparkle for Christmas and then Slow to farewell 2015. The combat BGM is rated "Not For Campers" and very suitable for those who want to control the battlefield. Anime-based features are also included. Same building method with Autumn, therefore Winter also have a Special version. Instrumental Gara music is now replaced by Japanese Vocal songs, and vice-versa in the case of Login screen Music. Anime-based features are also included. Combat BGM are the same, but TLMT also made a shortened version, with many differences especially in Battle Intro music. Battle Loading and Battle Result Image: Link download coming soon. Ys & Ys II Eternal, Ys I & Ys II Chronicles, Ys I - Ancient Ys Vanished Omen (Saturn Redbook), Ys IV The Foliage Ocean in Celceta, Ys Online - The Call of Solum, Ys Origin, Ys Seven, Ys vs. Sora no Kiseki Alternative Saga OST. Music Album: Ys - The Collected Ys MUSIC of Ancient and Modern Times, Ys Premium Music CD Box in Felghana, Ys Special Collection - All About Falcom - Memorial Sounds, Ys V Image Album, Ys V Orchestra Version, Ys VI Vocal Version - The Songs of Zemeth, Ys VI Instrumental Version - The Songs of Zemeth, Ys Perfect Collection, Ys ZANMAI, Ys, Very Best of. The Legend of Heroes Sora No Kiseki FC, The Legend of Heroes Sora No Kiseki SC, The Legend of Heroes Sora No Kiseki the 3rd, The Legend of Heroes Zero No Kiseki, The Legend of Heroes Ao No Kiseki OST. Music Album: Legend of Heroes (Sora no Kiseki SC) Gin no Ishi Kin no Tsubasa - I swear, Legend of Heroes (Sora no Kiseki) Vocal Version - Sora wo Miagete. Tales of Knight hood Sonic and the Black Knight OST. Spring/Summer/Autumn/Winter Edition's original work by NyanDora_Mech_Tank and TacticaL_Mech_Tank. Autumn Edition is now finished airing until the second season in next year autumn time. Stay tuned for our Winter Edition which are even better! Thank you for following us. While I was walking alone and wondering how is my Autumn Edition would be, a strange wind suddenly blew nearby and took the withered leafs from the ground to the sky, and then they slowly fall down. It's quite a view to be remembered. Just at that time, I realized that my upcoming music collection should be dramatic as the falling leaf but also strong enough to be remarkable like the wind. I ran to my home as quick as possible, started to collect musics to satisfy these ideas that fortuitously comes from the autumn sky. With the help from my fellow TacticaL_Mech_Tank, our Autumn Edition has been completed. We did our best to make it as good as it could. We hope that everyone else will love it, too! Enjoy, and see you on the battlefield! Info Combined styles of Western and Japan modern musics. Designed to be one of the greatest Music Mod ever: Slow and dramatic Garage music with fast but remarkable Combat BGM. Anime-based features are also included. In order to make Autumn Edition to satisfy more users, another special version had been build. This version replaced the instrumental garage music by Japanese vocal songs, without changing basic styles. Combat BGM and features are the same. Adaptation Currently N/A. Currently N/A. OST Sources Major: Wild Arms series. Minor: Grandia series. Major: Wild Arms series. - Zoom-in 5 levels (2 4 8 16 24 30) and Zoom-out. Wild Arms 1, 2, 3, Alter Code: F, 4, 5, XF Crossfire, Twilight Venom OST. Music Album: Alone The World: Wild Arms Vocal Collection and Wild Arms: Music The Best: Rocking Heart. Grandia II, Xtreme, III OST. Spring/Summer/Autumn Edition's original work by NyanDora_Mech_Tank. Summer Edition is now finished airing until the second season in next year summer time. Stay tuned for our Autumn and Winter Edition which are even better! Thank you for following us. After the success of Spring Edition, me and my fellow TacticaL_Mech_Tank were decided to make a sequel of it. Summer has come! It's time for memorable vacations with your friends and family. But don't forget that the battlefield is now becoming even hotter and eventful with our Summer Edition. Let's join us and have the greatest summer time ever! Name Summer Edition First ver. (released June 2015) Summer Edition Second ver. Info Second season, sequel of the Spring Editon. The music style is now mixed between Japanese/Chinese traditional and modern combat musics. Made by NyanDora_Mech_Tank. The First version is now added with many anime-based appearance features. Musics are the same, except login screen. Modified by TacticaL_Mech_Tank. Instruction: Extract the downloaded file, then copy 4 files in the extracted folder to your game folder. Attention: Some may not work for current WoT version. Summer Edition is now finished airing, so we can only rarely check the compatibility of it. Use with your own caution. Epic Dwarf Music - Mountain Dwellers and Pirate Music Instrumental - The High Sea by Derek & Brandon Fiechter. Spring/Summer Edition's original work by NyanDora_Mech_Tank. Spring Edition is now finished airing until the second season in next year spring time. Stay tuned for our Summer, Autumn and Winter Edition which are even better! Thank you for following us. Lunar New Year is coming and here we have a little present for everyone who also fighting in the battlefield of World of Tanks! Me and my fellow TacticaL_Mech_Tank has made a Joint Operation which is only happen four times every year, where the habits from each of us combined together and created most-wonderful music mod ever, called "Spring Edition"! This is our New Year gift for every tankers in the world! Info The first mod pack of the Seasonal Series. Combination between anime and traditional Japanese music styles. Focused on the traditional styles. Created by NyanDora_Mech_Tank. From the Traditional version, now added with many anime-based appearance features and musics. Traditional Japanese styles reduced. Modified by TacticaL_Mech_Tank. OST Sources Major: Okami, Okamiden. Minor: KanColle, Pokémon. Major: KanColle (and more). Instruction: Extract the downloaded file, then copy 4 files in the extracted folder to your res/audio folder. Attention: Some may not work for current WoT version. Spring Edition is now finished airing, so we can only rarely check the compatibility of it. Use with your own caution. Musics from Okami, Okamiden (collected by NyanDora_Mech_Tank) and Kantai Collection ( collected by TacticaL_Mech_Tank) OST. Spring Edition's original work by NyanDora_Mech_Tank. Edited by NyanDora_Mech_Tank, 12 July 2016 - 11:01 AM. I tried to do a Strike Witches skin for Hartmann Panther, tell me what you think. Edited by gulczas99, 19 August 2014 - 03:48 PM. I think that the camo painting should be fader so that it will emphasize the main pictures. The wheels with camo painting on look kinda weird, don't they? Sorry for the late response, just after this sunday and we'll get the hell out of this 'prison' semester, and I'll have my mod pack back to the update process . I'm also considering putting more mods into my res_mods folder, seperated by theme (right now I'm thinking of 2 themes: normal girls with tanks and GuP). For the bonus, here are some new result pictures I'm working on, hope to receive you guys' feedback. 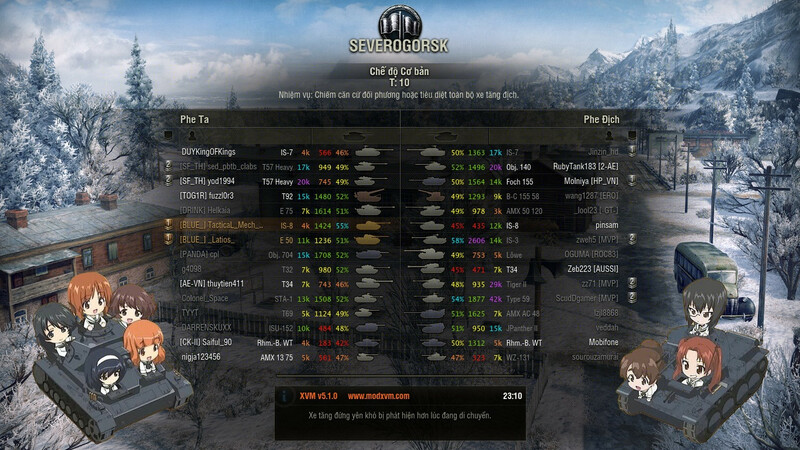 Sadly, the Pz IV.H has almost nothing. I usually can't find any skins that suit my favorite, I try making them base on another skin . Already chose the Pz IV.H section for you. Oh !! thank you for your advice ! I think it is easy and interesting for me, i`ll try it !! Please download in the Quick Download section above. This article will be written later. Right now I just want to take a long nap. Spring Edition represents a fresh start for everything. A new journey for the year, new objectives, new dreams. It will bring a celestial wind to push you forward, to inspire any idea you have, help you achieve whatever you are aiming for. The music style has many relations with Japanese traditional instruments. Spring Edition often releases in around March. One year ago, also in the very first days of Lunar New Year, we released the beta version of Farewell Edition. At that time, we intended to retire right after the final version of it. But coincidentally, soon after that, WG also changed the music platform that caused all of our previous mods unusable. Therefore, we have to start again from the beginning *sob*. Well, but somehow we're still able to do it. And here is our Lunar New Year gift to everyone. It does not change much compare to the beta version last year, but we intended to do so. We hope everyone will enjoy it! The meaning of Farewell Edition is comparing both Winter and Spring's atmosphere at the edge of lunar year: when the cold is still remain and the warmth is starting to emerge. It's a bridge between our last year seasonal mod pack and the new ones. Farewell Edition often releases in around Lunar New Year. It also using the same login video mod with Winter Edition. Instruction: Extract the downloaded file and read the instruction txt file inside it. - J1mB0's XVM Config with Damage Log and Hit Log. Farewell Edition's original work by NyanDora_Mech_Tank and TacticaL_Mech_Tank. It has been one year since the first generation of Winter Edition came to life, now it's time to recall the good memories. The pass year was really harsh for all of us due to many changes in the game settings. Most of our previous works became useless. Many plans were stopped. We were really sad and desperate at that time. However, after this day, it will be the start of something new. Let's keep the smile and join us to celebrate Christmas and New Year. Once again, with the help from my fellow TacticaL_Mech_Tank, here it is: the Winter Edition Rebirth. We did our best to make it as good as it could. We hope that everyone else will love it, too! The meaning of Winter Edition is cheering for friendships that were standing together to pass through the year with both good and bad memories. "Full of joy, plenty of sadness, and there is no holding back" is a good description of Winter Edition's music style. Winter Edition often releases in around December. Winter Edition - "Wonder World"
Second generation of the 2015 version - one of our most successful mod pack - has come with many upgrades. Designed to be one of the best mod pack of all time, just like the first generation, this one also keeps the music style from last year: "Not For Campers". Also, similar to the 2015 version, the Instrumental version's BGM was built to serve both the anime and non-anime fan. It should be suitable for everyone. Anime-based features are also included. Music/Voice mod by NyanDora_Mech_Tank and Interface mods by TacticaL_Mech_Tank. Since Autumn 2015, an additional Vocal version is a must for all seasonal mod pack. Compares to the Instrumental, in this one, many songs except combat BGM has been replaced by Japanese Vocal songs. We did our best to make it resemble with the 2015 version as much as it could, and here is the result. You will hear many songs similar with the older version, but more like a remix, plus many new songs added. Anime-based features are also included. Winter Edition's original work by NyanDora_Mech_Tank and TacticaL_Mech_Tank. Demo (Music only): updated July 12nd. "We all know this day would come. But not this soon." Right before our retirement day, WoT 9.14 released the new sound engine, lead to the destruction of ALL THE MUSIC AND VOICE MOD that had been created before. All of them, made by us and every other people, from all these years, are now become useless. It's like the Apocalypse for WoT music modders all around the world. We were seeking for helps, but everyone else were also in panic. 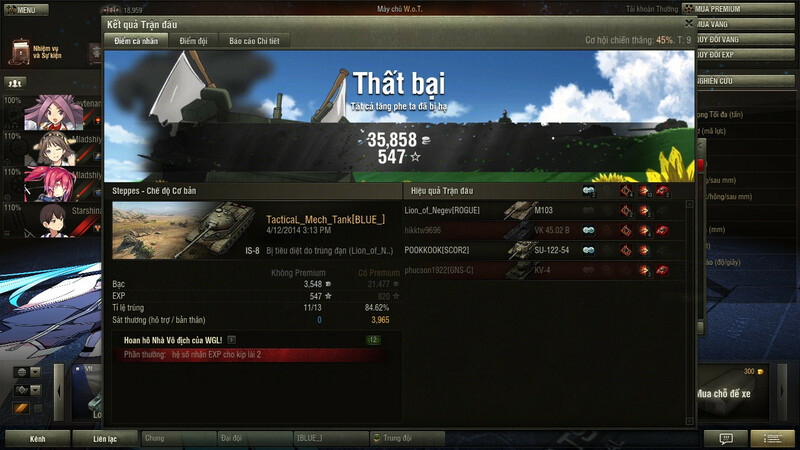 In NA, EU, RU and our ASIA community, many modders depressed and decided to give up. Only a few didn't lose their hope. They kept finding a way to rebuild what they have lost. Many methods and ideas had been given. From all of them, plus our luckiness and determination, we've found a way to create a fully working Music Mod. It's now become one of the first working music mods for the new sound system in WoT. But it's still in prototype and may contains some bugs. Fixing it alone seems to be impossible, so we decided to publish it, to call upon every modders to help us improve it together. So, here is our Apocalypse Edition. We hope that it will bring a new inspiration to all WoT modders around the world. Oh, and due to this incident, our retirement will be delayed for... who knows... may be forever~? Can't accept the lost of all music mods, we also decided to develop a prototype music mod. Finally, our work has completed. This Prototype Music Mod replaces all WoT OST with new Anime-related songs - from Login screen BGM to Combat BGM - all of them. However, the prototype was working not without some flaws and we will tell you in the below parts. During the development of Apocalypse Edition, a patch for Apocalypse Edition that extend the number of music without affecting game performance were planned. After many experiments, the FINAL version was published. However, the patch was working not without some flaws and we will tell you in the below parts. Attention: To enable music mod, change the Music Volume to lower than 100. Instruction: New individual mods links have been added. This time, for easier download and install, I uploaded them on drive so that you guys can choose the mod and the inside folder structure to copy it directly to your game folder (assume that you guys have a google account, which is 90% true, I believe). Just press the "Open in Drive" button (top right corner) and then you're good to go. Apocalypse Edition's original work by NyanDora_Mech_Tank and TacticaL_Mech_Tank. Streaming video using final version of Apocalypse mod pack (with FULL Music Patch). Recorded on July 10th 2016. Another replay video using our old version of Apocalypse mod pack (II.B with Gun Sound Mod). Recorded on April 16th 2016. Edited by NyanDora_Mech_Tank, 06 April 2017 - 08:02 PM. May be in the 9.3, I'll change some garage music (probably the peaceful theme). The res_mods folder will have full mods (all login, crew, ...) and seperated into 2 themes: GuP and not-GuP (but still have anime girls and tanks), that means loading screen, battle result,... will also have an alternative version. Just hope that I can make it in time, since I'll have some projects in this semester. Wow, looks like I just found out lots of new material for the pack, now I'm starting making extra changes for the mod that haven't mentioned in the note. Keep in mind that I may need 1-3 days to check the compability (and remake the pack if any problem occur) so if 9.3 came out and this post still hasn't been updated, just wait till it has the announcement. WOT Asia / Australasia Language Based Communities → English Speaking Community → Fan Zone! 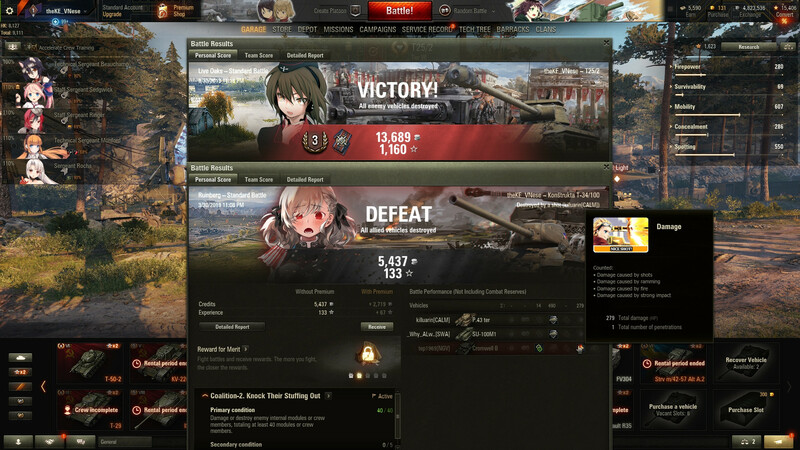 → Player Made Mods & Addons → Girls und Panzer Duck team Luchs skin?